SimRush can pick up a 4G connection where a mobile phone can’t get 4G, indeed even when your mobile device can’t get any signal at all. 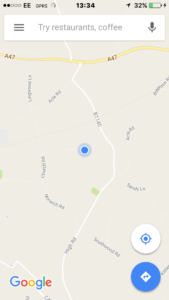 The Google map image in this post shows the EE signal strength to our mobile device in SimRush One at the time of the speed test. As you can clearly see from the image below, the mobile device was only able to see 3G yet SimRush was able to find the 4G to deliver the super-quick speed test result below. SimRush Car One has been out on the road again! 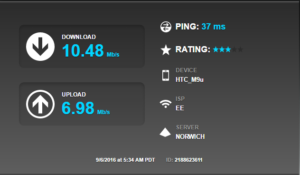 Another fantastic speed test logged!! All tests are performed at ground level. Actual speed will be significantly faster when hardware is installed as per recommendation in a higher location e.g roof of premises. This entry was posted in Blog, Youcantseeit and tagged 4g, broadband, simrush, speedtest. Bookmark the permalink.